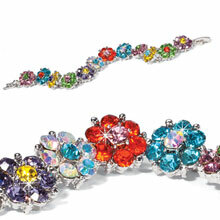 So colorful you won't want to leave it in the jewelry box! 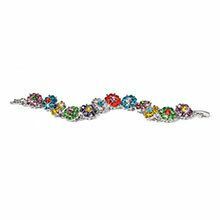 Rhinestone link multicolor flower bracelet on silver-tone metal shines in a brilliant rainbow of colors. 7"l.
This turned out to be a real gem. The bracelet is very well made snd looks quite elegant. Gorgeous rainbow colors...fits my small wrist perfectly. Very pretty! 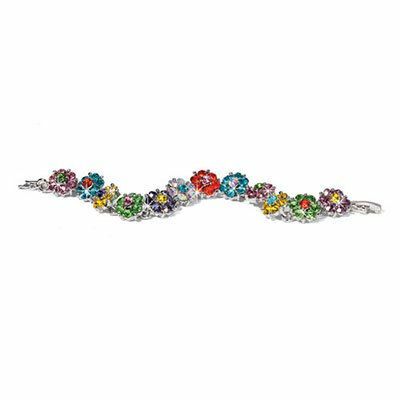 I love the colorful sparkle this bracelet shows. I don't wear much jewelry, but this is fun. It's a little snug and I worry it might break, but I've had many compliments when I wear it.